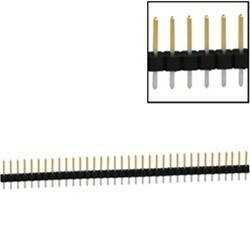 A single row of 36 male pin headers, these male pin headers are 0.1" (2.54mm) pitch and can be cut to any size. They are mainly used to connect the ArduPilot Mega and the Oilpan Shield together, if you have bought the "Oilpan with pins" you will not need to buy these. The Conn Male Headers can also be used with any custom PCBs, Air speed sensor kits or as general custom headers for electronic projects.